If you have information or photographs to contribute to the history of Immaculate Conception please contact Mark Schall at markschall@hotmail.com or by phone (570) 398-7763. The year was 1838, Martin Van Buren, the 8th president of the United States was in office and Father Nicholas Steinbacher, a Jesuit missionary and assistant pastor at St. Paul's Catholic Church in Churchville, (now called Bally) Goshen­hoppen Township, Berks County, Pennsylvania, was assigned to adminis­ter to Catholics in the northeastern and northcentral Pennsylvania areas. It is not known how many years prior to 1838 that Fr. Steinbacher first visited this area, but a deed in the Lycoming County Courthouse states that on April 14, 1838 he purchased 414 1/2 acres of land known as "Stanhope" in what was then Limestone Township. Present church property was part of this purchase. Records indicate that he was present at the confirmation in Milton in September, 1837. He probably visited, at that time, the several Catholic families living in the Nippenose Valley area. Soon after purchasing this first tract of land, which was the Catherine Kurtz Warrant, he began selling parcels to new parishioners. On May 14, 1838, he sold fifty acres for $31 to Francis, Joseph and Mathias Harter. In July of that year he sold to Michael and Jacob Zuber, 25 acres each for $18.75. The next year, 1839 he purchased at least two more tracts, one containing 435 1/4 acres, the Peter Orwig Warrant, which bordered the first parcel on the east. Again he.sold this land to parishioners. On August 11, 1842 he sold to his brother John fifteen acres which included use of "water from the spring near the Chapple" (sic.). (While installing a water line from the reservoir to the new social hall in 1987, the remains of a stone foundation were discovered a few yards east of the reservoir. It is believed that this was the site of John Steinbacher's home,) He sold, on May 20, 1843 from the Peter Orwig plot, twenty acres to Michael Dinger (Dincher). On October I, 1844 he sold twenty acres to John Schilling for $60. This parcel was bordered on the east by that sold to Michael Dincher. The Schilling deed dated May I, 1846 listed Father Steinbacher as a resident of Adams County. This is a partial list of properties sold according to Lycoming County Courthouse Records. It is said he bought and sold about 1,200 acres at an average cost of $1.00 per acre. A good number of the first parishioners were from Father Steinba­cher's home parish of St. Paul's in Churchville. (The names of the church and village have since been changed to Blessed Sacrament and Bally respectively.) The name and years of the arrival of the families is recorded in the "Family Book," compiled by Father Treyer. By 1842, eighty families made up the parish. This number increased rapidly until the number reached 250 families. Then the Citizens Gas and Water Co. of Williamsport or the Williamsport Water Company (now the Williamsport Municipal Water Authority) began to purchase farms from the parishioners in the eastern section of the parish. Several of these families stayed within the confines of the parish by moving into Nippenose Valley, while a good many moved to Williamsport. Several families also moved West with the migration taking place there. As Williamsport and Jersey Shore became more industrialized, more families gave up trying to eke an existence on the farms and moved from the parish, until it had dwindled in size to about 100 families around 1935. Sometime after that it began to increase, and has since grown to 265 families, 1004 members. It is not known exactly when the first church was built or where, except that it was very near the present rectory. Records indicate it to have been a two-story structure, with the first being of stone and the second of wood. The first story was used for a time as a school. 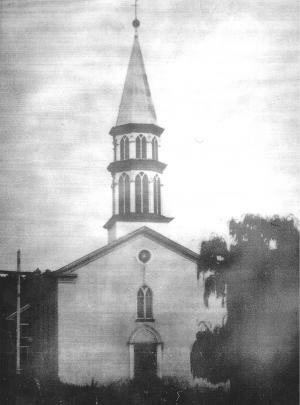 The cornerstone of the second church was blessed by Father Steinba­cher in May of 1842. This church also was of stone. Its location is known and the site of three of its sides can be seen during a dry spell such as one experienced this summer. The grass over the remaining stone walls under the earth, tend to die out. It is situated between the rectory and cemetery. Although Fr. Steinbacher had designed this second church with plans to enlarge it, this never came to be, as around 1855, Fr. Grundner, then pastor, started making plans for the third and present church. On February 13, 1856, John T. Steinbacher died from injuries suffered while cutting wood two days earlier, to construct the church. His wife was the former Margret Dincher, daughter of Michael and Maria Melchior Dincher. He was the son of John and Maria Chauvin Steinbacher. 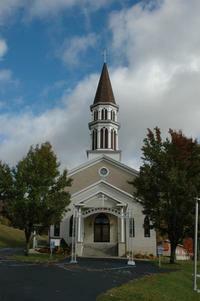 In 1860, the church was completed and dedicated under the direction of Fr. 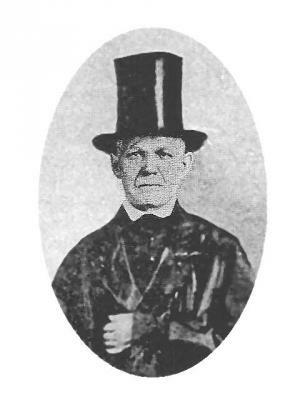 Joseph Hamm. The inside dimensions are 56 feet by 90 feet and 23 feet high. The walls are of mountain stone and the timbers supporting the floors and roof are hand-hewn. Some of the carpenters who were not members of the church received a wage of one dollar per day. When it came time to make a settlement, some of them donated as much as half of this money. The main carpenter, called in the books, architect, received $1.50 per day. As far as can be ascertained from the ledgers regarding the payment for labor, they are as, follows: carpenters $1,429.26, plasterers $202.54, painters $176.99, blacksmiths $57, making a sum of $1,865.79 total for labor. Add to this the cost of material, such as lime, plaster, and finish lumber. According to the records, the total sum was about $3,000 to $4,000. The income for the parish for the two years 1859 and 1860 was $3,150. 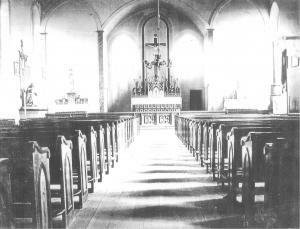 After the present church was completed the second church was then used as a school and the original church as a rectory. In 1872, under the pastorate of Fr. John Lenfert, the present brick rectory was constructed. In 1874 the second Church was dismantled and the lumber used to build a new convent and school which was located on the site of the present convent. 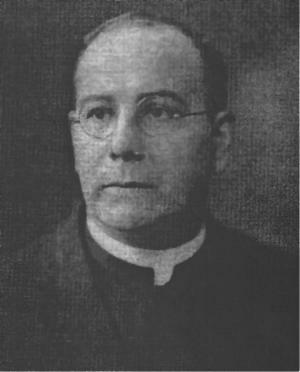 In 1914 Reverend George T. Schmidt decided that in order to develop and keep alive the parish life and activities, they should build a hall where meetings could be held. Although there was debt resting on the parish and very little money with which to begin, nevertheles, he and his people with dauntless courage began the task. Much of the lumber was cut from the forest land owned by the parish and the work was mostly donated. Father Schmidt himself took his hammer and saw and spent many a day in helping to complete the work. The hall was a frame building with basement and upper floor. The upper hall is equipped as a stage and dining hall; the lower hall is provided with a kitchen. The hall was erected at a cost of about $1,000. It was the center of the social life of the parish and was also a great help in increasing the revenue of the parish. 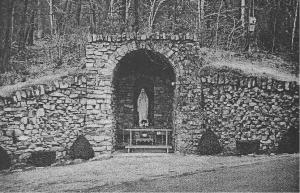 The following year the Lourdes Grotto was built. This work was aided by a bequest from the estate of Mr. Andrew Birkle, of Williamsport, PA. The parishoners hauled the materials, did the necessary digging and the mason work without compensation. The Grotto is not claimed to be a replica of the famous Grotto of Lourdes. It has only the statue of the Immaculate Conception, which was carved out of a solid block of Carrara marble in a workshop of Genoa, Italy. The blessing of the Grotto took place October 14, 1915. The Right Reverend Monsignor Peter C. Christ, Vicar General of the Scranton Diocese, performed the rites and preached the sermon. The parish social hall was rebuilt in 1987 into the building that stands today after it was severely damaged from a tornado. True to form, the parishoners, like many of teir progenitors, performed much of the work with the exception of laying the foundation and building the frame.